We’d love your help. Let us know what’s wrong with this preview of Nothing Is Impossible by Christopher Reeve. To ask other readers questions about Nothing Is Impossible, please sign up. What is the reading level? I've always admired Christopher as an actor (especially in Somewhere in Time) and as one of the most inspiring people on this planet. So when I came across this book for sale in the library I grabbed it eagerly. Half way through it I was in tears in a cafe as I read about the everyday details of his debilitating new life and the amazing way he kept his faith and hope alive. Every small series of excercises and physiotherapy took hours to set up, travel was a nightmare but he still managed to fin I've always admired Christopher as an actor (especially in Somewhere in Time) and as one of the most inspiring people on this planet. So when I came across this book for sale in the library I grabbed it eagerly. Half way through it I was in tears in a cafe as I read about the everyday details of his debilitating new life and the amazing way he kept his faith and hope alive. Every small series of excercises and physiotherapy took hours to set up, travel was a nightmare but he still managed to find time to petition for more funding for research and speak for those who couldn't. It was pretty exciting to pop in the first CD and hear Christopher Reeve read his own story. He was a decent writer and spoke pretty well considering the fact that he was connected to an oxygen supply. Because of this, I'd be interested in reading his other books even though this one, "Nothing is Impossible," spent a lot of time impressing upon us the importance of allowing reseachers to have stem cells to find cures for our health issues. Whether or not I agree with his position, the book could have been stronger if it were more focused on his personal journey rather than a political agenda. This autobiography reminded me why most of today’s are dull and not impressive to say the least. The writer needs to have a life story in which a morale lies. An autobiography is not an arrogant “tour de force” of one’s achievements and it is certainly not an exaggerated account of “the ordeals” that caused them suffering (most of today’s famous personalities write about not having a Hollywood star on the Walk of Fame because it is an understatement of their talent, or just a blow to their ego) This autobiography reminded me why most of today’s are dull and not impressive to say the least. The writer needs to have a life story in which a morale lies. An autobiography is not an arrogant “tour de force” of one’s achievements and it is certainly not an exaggerated account of “the ordeals” that caused them suffering (most of today’s famous personalities write about not having a Hollywood star on the Walk of Fame because it is an understatement of their talent, or just a blow to their ego) …You get the point. Nothing is Impossible shows the struggle and determination of a man who was at the top of the world one day and found himself unable even to lift his finger another day. It is a tale of human force of will against the odds and fatality of life. Really, there is not much to say here, except that whenever I read this sort of books, I need to remind myself that life is but a dream, an ethereal existence that could turn into a nightmare in a particular unfortunate moment. This book gave me hope in many ways, not just for victims of paralysis. It helped me look at life differently and helped me face my own demons of having a beloved brother with ALS. Watching him suffer as he dies inch by inch is horrifying, yet being able to believe that maybe some kind of help, even to the extent of a reversal of this insidious disease may be around the corner gives me great hope. God willing, it will come sooner than later. The courage of this couple and their family is off the This book gave me hope in many ways, not just for victims of paralysis. It helped me look at life differently and helped me face my own demons of having a beloved brother with ALS. Watching him suffer as he dies inch by inch is horrifying, yet being able to believe that maybe some kind of help, even to the extent of a reversal of this insidious disease may be around the corner gives me great hope. God willing, it will come sooner than later. I was not expecting it to be read by Christopher Reeves, but I think that made it all the more special. I first thought how challenging that must have been for him to read for hours on end for the book given his condition, but by the end of the book I imagined he had no problems. I began listening with no other info about him other than he was (and will always be) Superman, his accident, and that his wife died of lung cancer without ever having smoked. That said, I was very surprised by the book. His resilience and management of his condition is admirable. I never knew what a great sense of humor he had which is evident in the writing. He said it was a a great way to manage the anger he felt. This book offers some look into the reality of a quadriplegic's struggles to grasp normalcy in his new world. This favorite Superman of so many of us obviously worked friendly to help others with injuries that part him in a wheelchair in the first place. The sad part is that he never ( at least in this book)) found the saving grace of Jesus Christ which would have given him peace. He did amazing work for stem cell research, however and it's an excellent book.. Highly recommend! Christopher Reeve is such an inspirational, intelligent and well-spoken individual. He writes with clarity, and manages to crack me up even when addressing rather depressing topics. The fact that he stood up, unwavering, in spite of the accident that left him paralysed, makes him such an admirable figure. Thank you Mr Reeve for sharing your personal story & struggles with us. Even though you have passed, you continue to inspire people every day. Really interesting and really inspiring memoir by Christopher Reeve. What an incredible person who overcame huge obstacles to live a beautiful and fulfilling second chapter in life despite an earth shattering accident. Interesting details about spinal cord injuries and rehab and insurance problems as well as the politics and challenges of scientific research and funding. Very inspiring. In this book, Christopher Reeve talks about all the stages he went through after his terrible accident and what has given him strength and hope after it. After reading this, I have nothing but the greatest respect for the man, who was not only Superman, but also extremely intelligent and determined to find a cure for spinal cord injuries. R.I.P. Interesting to listen to Christopher Reeve read this himself. This book mainly focused on the time after his accident that left him paralyzed. He had such a resilient spirit and great resolve to do everything he could for spinal cord research. A short, gentle but sobering read that is inevitably hampered by the fact that he died a year or so after the book came out. I'm about to start his autobiography 'Still Me' which I'm hoping will resonate more with me. An amazing and inspiring perspective resulting from the author's personal tragedy and subsequent reconciliation. Christopher teaches us all to treasure what we have, life itself and to find triumph in each day. His other book Still Me is an inspiring read as well. Terrific book. Listened to the audio edition read by the author. I learned about spinal cord injury in school last year and wished I had read this back then. I definitely want to read his first book now. Christopher Reeve has to be the most inspiring person Ive ever come across. From Superman to an even greater Man. good book. probably not a re-read, but worth it to have experienced. very personal and personable. I enjoyed reading this book and learning about the triumphs and struggles Mr. Reeves faced as he took on his health challenges. One of the best read ever. A lesson of life telling us to never give up. No matter what life throws at us there is ALWAYS HOPE, ALWAYS! I once saw Reeve chatting to Larry King Live and was almost in tears. Not in pity, but personal distress that someone like myself (who has a healthy body) had decided to skip aerobics because I "didn't feel like it". How pathetic can we get? We're lucky because we have healthy muscles - not due to an aide exercising them for us, but because we can move independantly. Reeve's history as Superman actor who fell off a horse breaking his neck close to the brain stem, is fairly well-known. What is le I once saw Reeve chatting to Larry King Live and was almost in tears. Not in pity, but personal distress that someone like myself (who has a healthy body) had decided to skip aerobics because I "didn't feel like it". How pathetic can we get? We're lucky because we have healthy muscles - not due to an aide exercising them for us, but because we can move independantly. Reeve's history as Superman actor who fell off a horse breaking his neck close to the brain stem, is fairly well-known. What is less well-known, is that he was able to move his left index finger eight years after the accident. This should've been impossible due to his injury. In fact, this book relates that he was even able to move his wrist, though I doubt he was able to actually feed and wash himself. His determination that he will walk one day kept him in the gym for upto four hours a day. He loved going into the pool, after one of his physicians suggested he try. Surrounded by water, he was able to move his legs as if walking! He absolutely loved this. But there was always something that happened that prevented him from doing more. He relates how the doctors tried to teach his diaphragm to function on its own. He practised it until he was managing upto six hours without his ventilator. Then one day, he couldn't manage a breath on his own because his lungs had filled with liquid during the night and he needed to recover from this infection. The same applied to his exercises in the pool. As soon as he managed a lot, a bed sore or other kind of infection prevented him from entering the pool for upto six weeks, leaving all the work he'd done before useless. It was a quick read, he's very clear. It gives you an into Superman's upbringing, the kind of life lived in New England, how he reacted to being paralyzed, his experience with religion and spirituality, his almost miraculous breakthroughs through physical therapy, the difficulties faced figuring out the whole medical insurance system and getting proper support and re-gearing the insurance sector's approach to people who become incapacitated so as to help them get better. But, of course, his big It was a quick read, he's very clear. It gives you an into Superman's upbringing, the kind of life lived in New England, how he reacted to being paralyzed, his experience with religion and spirituality, his almost miraculous breakthroughs through physical therapy, the difficulties faced figuring out the whole medical insurance system and getting proper support and re-gearing the insurance sector's approach to people who become incapacitated so as to help them get better. But, of course, his big point wasn't about all of that, but rather you find out at the end his glimmer of hope in stem cell research for cures for people that have suffered accidents like his. He sympathizes with people who are adamantly religiously opposed to it, but shows that there is still a lot of confusion over what constitutes a human and the hypocrisy over where it's allowed and where it's not. An inspiring biography of a champion for achieving the impossible. 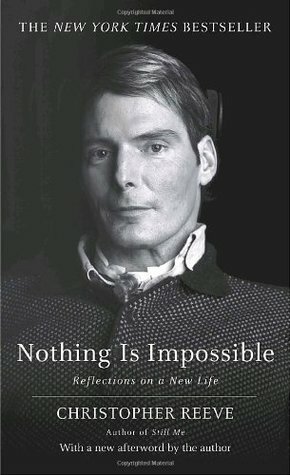 I recently finished Christopher Reeve's second book "Nothing Is Impossible" he wrote after his tragic accident that left him paralyzed. It is an inspiring look at how he faced the unimaginable challenges of the "permanent" loss of his arms and legs. In the end, despite all of the scientific evidence telling him that he would not recover any movement, he persevered to recover movement past anyone's expectations, including his own. O An inspiring biography of a champion for achieving the impossible. This was one of the truly inspiring books that I've read ( and I read a lot of inspirational books). Chris Reeves was superman in the true sense, not just in his movies but in the way he battled his fate with equanimity. His books made me think, how often do we look at the glass half empty, when it is half full,how petty our worries are compared to many other people out there, how much we take for granted in our lives.My favorite quote from the book was "a year ago I was wondering if I'd ever mo This was one of the truly inspiring books that I've read ( and I read a lot of inspirational books). Chris Reeves was superman in the true sense, not just in his movies but in the way he battled his fate with equanimity. His books made me think, how often do we look at the glass half empty, when it is half full,how petty our worries are compared to many other people out there, how much we take for granted in our lives.My favorite quote from the book was "a year ago I was wondering if I'd ever move again, today travelling halfway across the world just seems like a minor logistical challenge." As a side note: apparently his wife Dana stayed with him every step of they way throughout the 9 years after his accident, but died a couple of years after his death. Truly a match made in heaven. I found this book to be good but not extraordinary. I feel so guilty saying that because it is Christopher Reeve for heaven's sake! I do find his experiences, drive, and persistence highly inspirational. However, in the book I didn't feel that "Nothing Is Impossible" was an appropriate title. It read more of a memoir of his recovery process to me but I didn't get the feeling that I could conquer the world from it. I did find it inspirational in a lot of ways and am glad that I read it. It wasn't I found this book to be good but not extraordinary. I feel so guilty saying that because it is Christopher Reeve for heaven's sake! I do find his experiences, drive, and persistence highly inspirational. However, in the book I didn't feel that "Nothing Is Impossible" was an appropriate title. It read more of a memoir of his recovery process to me but I didn't get the feeling that I could conquer the world from it. I really enjoyed (if that's the right word - maybe was impressed by) the book Still Me, which I read when Mr Reeve was still with us. This one was less dramatic, but reading about hope and faith knowing he'd lost his fight made it a different read. I learned a bit more about his decision to carry on, to struggle, to make the best advances he possibly could, for himself and others. He'd made more progress in moving his fingers and legs than I'd realised. Always a humbling thing thinking about people I really enjoyed (if that's the right word - maybe was impressed by) the book Still Me, which I read when Mr Reeve was still with us. Christopher D'Olier Reeve was an American actor, director, producer, and writer. He established himself early as a Juilliard-trained stage actor before portraying Superman/Kal-El/Clark Kent in four films, from 1978 to 1987. In the 1980s, he starred in several films, including Somewhere in Time (1980), Deathtrap (1982), The Bostonians (1984), and Street Smart (1987). He also starred in many plays, Christopher D'Olier Reeve was an American actor, director, producer, and writer. He established himself early as a Juilliard-trained stage actor before portraying Superman/Kal-El/Clark Kent in four films, from 1978 to 1987. In the 1980s, he starred in several films, including Somewhere in Time (1980), Deathtrap (1982), The Bostonians (1984), and Street Smart (1987). He also starred in many plays, including the Broadway plays Fifth of July (1980 - 1982) and The Marriage of Figaro (1985). In 1987, he led a public rally in support of 77 Chilean actors, directors, and playwrights who had been sentenced to death by the dictator Augusto Pinochet for criticizing his regime in their works. Pinochet canceled the sentence after the ensuing media coverage, and Reeve was awarded with three national distinctions from Chile for his actions. In the 1990s, Reeve acted in such films as Noises Off (1992), The Remains of the Day (1993), and Village of the Damned (1995). In May 1995, Christopher Reeve was paralyzed in an accident during the cross country portion of an Eventing competition. He was confined to a wheelchair for the rest of his life. He lobbied on behalf of people with spinal cord injuries, and for human embryonic stem cell research after this accident. He founded the Christopher Reeve Foundation and co-founded the Reeve-Irvine Research Center. Reeve died at age 52 on October 10, 2004 from cardiac arrest caused by a systemic infection.